It is a good idea to hire interior designers, if you have invested quite a bit of money for the house. The main purpose of interior designers is to make the place look good and pleasing both aesthetically and functionally. Moreover, decorators know how to make the house look attractive based on the personality and needs of their client. Hence, they have their own personality shown through the interior designs and appearance. They also help you in accessing and arranging materials, even if you do not have time for arranging the house according to your styles and desires due to your work and busy schedule. Though it might sound strange that hiring a professional will help you save money, since the overall cost will include the designer’s fee and other related expenses, but hiring an interior designers can be really helpful for first time owners as they will reduce all the unwanted spending and also prevents the owner from making costly mistakes. Hiring a professional interior designer also increases the value of your home. Listing interior design while selling your house can be appealing for potential buyers and also increases the net worth of the house. It can also set the house above the competition and will be a class apart. Interior designers have a professional take on the situation rather than the owner. They have the extra set of eyes that will notice the most unlikely of issues that normally people would not find. They would follow a set action plan and will inform the owner of the house about the various steps taken. There are no hidden costs and hence will encourage the owners to spend more efficiently. This will provide a positive impact on the overall budget. Also, interior designers try to use the given resources as carefully and efficient as possible. Sometimes they will also recycle things when needed. They will decide what will be repurposed or what will be discarded. An interior designer knows how to manage the expenditure for arranging and organising the house, depending upon the budget of the customer. A designer also knows what all resources to search for to make your house more appealing and beautiful within a strict budget. This saves time and money since the customer do not have to spent long hours researching and noting what all products are needed for the house. Also, the customer doesn’t have to look up for the brands and the prices. A designer will have the necessary details and information at hand, so that the customer do not have to spend time investigating and researching for products. A good designer will always help you to create a good relationship between the house owner and the architect or contractor and can help you in tackling major design flaws that normally happens in the process. This is an important and a crucial step for saving time and money. Also, professional interior designers tend to look into details that we usually overlook. This might save a considerable amount of money along with proper planning and will be beneficial in the long run. Also, they keep in mind about the most important factors of a house, that is the lighting and furnishing. They have high priority for lighting and furnishing. If your sofa and other furnishings are placed in the middle of the room, then the interior designer makes sure that there is necessary floor furnishings to complement the room and the extra attachments present inside the room. One of the perks of having an interior designer for hire is that the designer will have access to resources and materials at reasonable prices that the common people might not have. They have a wide network of people who are within this industry, which may prove helpful while designing your house. This is a good advantage, as the customer get to see a wide variety of materials and that too at prices that are within the budget of the owner. By using the ideas and opinions of the customer along with the collected resources, the designers helps to make the house look unique, collected and professionally done. As mentioned earlier, most of the interior designers have a large contact list of efficient workmen such as plumbers, contractors and electricians that can be reached and will be helpful during the times of your building construction. This can help home owners and builders enough time and money for searching such individuals. Also, they might have a large client list, so it is easier to evaluate and take note of various completed works of the interior designer. Having such a large network is necessary for sociable workers especially interior designers to survive in this industry. Most of the interior designers tend to think outside of the box and try to think about ways to improve the house and make it more appealing. This results in an addition to a wow factor in the final product. They will help you to look things differently and in an artistic manner. They will add an aesthetic factor to the overall look of the house. Often at homes, everyone might not have the same opinion on how the house should look, especially after a full renovation. Everyone’s opinions might clash together and no unanimous decision is done. An interior designer is a person who will collect all these opinions, group them together and would add all of them together to form a product that would please most of the people in a family along with a good aesthetic appearance. Let the interior designer take important decisions so as to produce a good final result. One of the most difficult tasks of stylising your house on your own is to make things work. If you are not an interior designing then you might find it difficult to make all the things work and go well together.This might end up you making costly errors which will eventually cost a lot of money, if proper thinking is not given. If you have various items that you have lying around the house, then they would be difficult for you to put them together and would be hard to find a suitable remedy for the problem. On the other hand, an interior designer faces these kinds of problems almost every day and might have good tips and tricks that they use so as to get the most pleasing and efficient result. If you have decided on renovating the house by yourself, where there is a need for replacing the wall fixtures, lighting and other attachments, then it is necessary that you seek out for professional help. Do not try to do these things on your own with the mentality of saving money. In reality, the opposite will happen. You will be compelled to do something stupid and will end up paying to fix what is broken, which will be more than the intended budget. The fact that they have studied this field makes them more suitable for trusting and letting them take control of the whole renovation. They have the required knowledge and know-hows on how to handle a renovation efficiently. All the customers has to just tell what are all the needs and the essential points that needs to be taken care of and in turn they will provide a renovated house with that particular style and identity. Interior design is a field which requires expertise and experience. Most of the professionals are very much interested in their jobs and they enjoy most of their work and earn a living through it. For sure most of the owners have a picture in mind on how the interior would look like. But they do not have the correct resource on how to make it a reality. So they are discouraged to take the next step. When you hire an interior designer he will take the complete charge of the project and will have a better image of the final project than the owner. When the design is done, the result might look the same as what the owner had imagined or it might exceed his/her expectations. Most interior designers follow and keep up to date with the various trends that happen in the architecture industry. One of the recent trends in home management is the concept of conservative, recyclable and efficient energy. To make the design more efficient and usable, most of the designers follow the concept of environment conservation and use a green and eco-friendly interior to conserve energy. The interior designer knows how to draw the overall structure of the house and also how to utilise the right kind of flooring, tiles, windows, light fixings and others. This will in turn help you to save a lot of money on the future by wasting a less amount of energy than before. And also helps to make the environment clean and tidy. Designers have an eye for detail, especially interior designers. As mentioned before, they always think outside the box and also take notice of what all things can be improved. They also look into products and study its form and factor and also give importance to the aesthetics of the object. They know way better than the owner of the house and are determined to create the final product to meet their expectations. They also take time to research and look into the various lighting, furnishings and accessories that is needed for the renovated house, which will also save time and money for the customer. It is an inevitable fact that renovating a house can be an enormous amount of stress added to you. Especially when you are a working individual, it will be very hard to manage the stress of renovating a house along with your career, family and also various other reasons. So to lessen this burden, it is wise to hire an interior designer at a reasonable price. He /she would do the required amount of work if paid and treated nicely. By the end of the proposed time, he/she will be able to show you the final product. Most of the people know about the commonly used and generic colour combinations involving colours such as white, off-white, grey etc. but, after discussing with an interior designer most owners will be surprised to know that they can combine the colours effectively to make the room look more lively and pleasing without looking poor and bland. This will make your home look more unique and adds an extra surprise factor. Also, they will also mix colours and form colours that you might not even have seen which might suit the inside walls of the house very well. 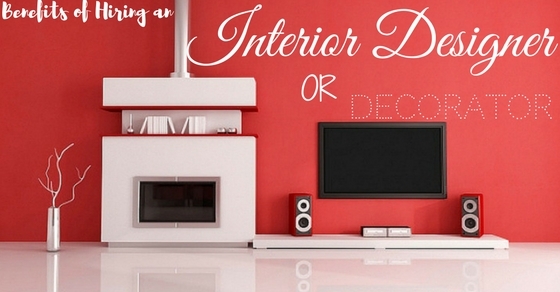 You will acquire a lot of advantages if you hire the right type of interior designer. They might have an artistic insight and this might help you to provide the required dream house. You might even like the output and might even love your house even more. Another great factor is that, after renovation you do not have to be bothered by the interior for a few years until the next change. This will help you save money in the long run and also will eliminate the charges of looking after the house and maintenance. It will also add monetary value to the house. So it is wise to hire an interior designer when in need.